I’m embarrassed to admit that it has taken me forever to remodel our powder room. I was a bit over zealous in ripping apart the bathroom two years ago, and it has sadly sat in a demolished state ever since. Why Has the Renovation Taken so Long? So the bathroom sat untouched for 2 years. We have 2 powder rooms on the main level, so it wasn’t a major inconvenience to be without one of them. Obviously not a builder grade bathroom right? The prior owner spent a pretty penny on this room between the fancy commode, 6 foot mirror, and custom paint job. While the vanity is beautiful, we want a style that is more simple, modern but still elegant. 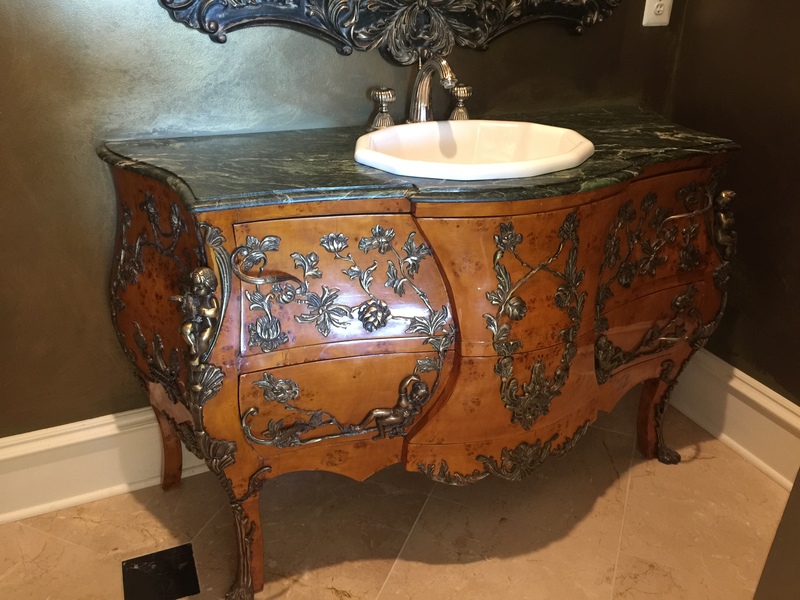 The commode has a heavy marble countertop and very decorative gold raised accents. Notice the angels on the corners? 🙂 It appears that the commode was a piece of furniture turned into a vanity, the drawers on the front open as well. The white sink is pretty and has a shell shape design. The faucet is lovely as well, we have others in our master bathroom and we like them. The hot and cold knobs include a crystal which adds a pretty touch. Overall, we want to change the style to a modern french county powder room instead of an ornate french provincial styled bathroom. And so it began. We ripped out the vanity, sconces, and mirror – but the toilet was still functioning! I wasn’t crazy enough to remove that too! This is what the bathroom has looked like for two years. With plumbing hanging off the wall, it appears that the original wall color was eggplant. The marble flooring will stay in the bathroom as it leads into the hallway and foyer. I contemplated changing it out, but decided against it. This is a rough drawing of the room. Looking at the dimensions on paper, I realized we were somewhat limited in choosing a vanity due to the size and configuration of the space. The 80″ wall, where the previous vanity was located, seemed like a good choice. But the 44.5″ depth creates space issues for large single vanities, especially ones that are 40″- 50″ long and will make the area feel tight. The plan for the remodel is to relocate the plumbing and sconce lighting from the long 80″ wall to the smaller 44.5″ wall. We feel this configuration is better suited for the room. In doing so, we have to choose a smaller vanity, one that is proportionately sized for the space. Along with a new vanity, we will install new sconces, a new mirror, new toilet, new hardware, and paint the walls black. What do you think? Check back soon to see the progress. For more posts about home remodeling, subscribe to Happy Haute Home and follow along on Pinterest HERE, and Twitter HERE and feel free to pin and tweet your favorite pics from Happy Haute Home. You can also get daily home decor inspiration and exclusive content by following along on Instagram HERE. For me, it’s “yikes” on the before bathroom. But as you said, the previous owners clearly put time and attention into it! I guess it’s the difference between “house” and “home”: you’re making your house into your home. It explains everything that the previous owner was a single professional athlete! It’s been interesting to say the least. I have some pretty wild stories and as you know dealing with a lot of decor issues. But it’s all fun and I love it!